Physical Therapists, Chiropractors and other body-healing professionals know that a good healing process starts with solid equipment such as a treating table for their patients. 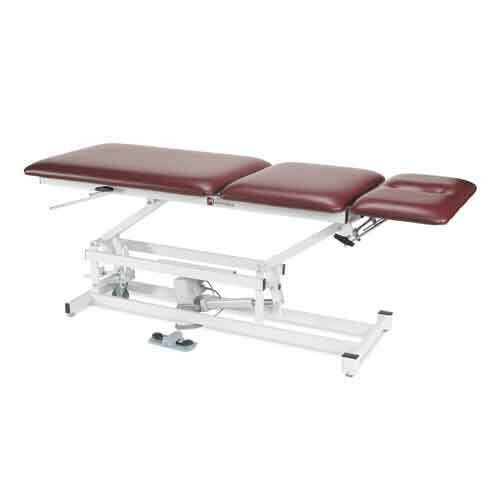 The Armedica AM-350 Treatment Table offers a sturdy frame with a comfortable pillow-like surface to ensure patients get the most comfort during their visits. This three piece table features a head section that raises to a 45-degree angle and lowers to 90 degrees. It also has a contoured opening for the face, meaning patients who need to lay on their front-side will be able to breath as they're being treated. No suffocating during the treatment process. The center section is flat and offers patients the comfort of being able to lay down on their front, back or either side while being treated. The mid-section keeps the back in an optimal position. The table's footswitch makes raising and lowering it easy. The foot section is the longest section and it also raises up to 70 degrees. That amount of adjustability gives the professionals the angles they need to treat any kind of lower-body pain or chronic ailments. Armedica's AM-Series treatment tables gives medical professionals the ability to fully adjust the height for the best results with the least amount of effort. Patients will also be comfortable knowing they can get on or off the table without any trouble.